Why a teabag boat? 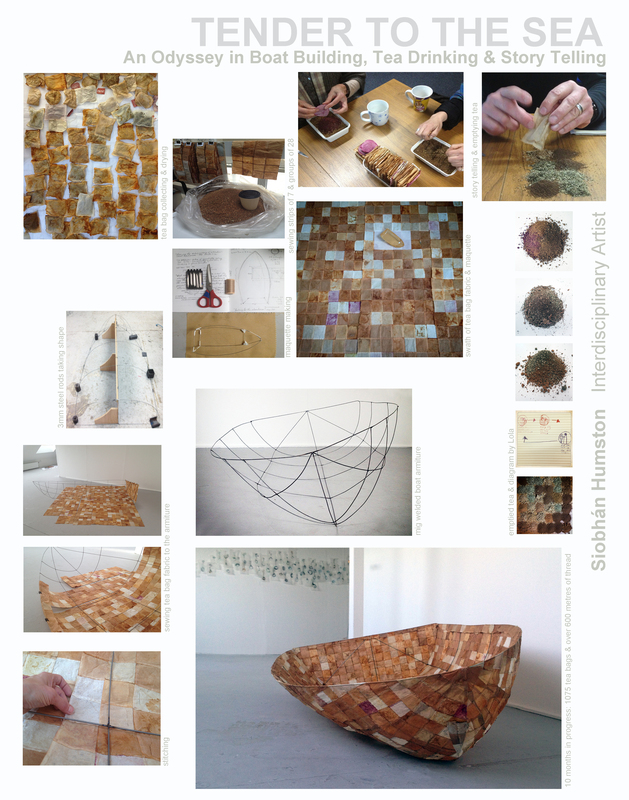 When I first arrived in Falmouth for the MFA (Art & Environment) course, I really wanted to make a shift to being careful and thoughtful about what kind of materials I used to make art and in turn, what those materials would say about what it was I made. Using reclaimed materials was an obvious option, especially while I waited for my shipped art supplies to arrive from Canada. I have previously saved tea bags to draw on, and it was definitely something that there was lots of, both at home and in the assigned post-grad studio. I began collecting and drying them before I knew what I would make but it didn’t take long for me to decide that I would make a boat. A life size rowing boat. The boat, here in Cornwall, is ubiquitous, and although it is a well-worn symbol, I felt the idea of having it made of a recycled tea bags would give it an intriguing spin. My work has been centred on man’s interaction with the environment for several years, combining man-made objects with abstracted aspects of nature, so this was a natural extension of that theme. I had also started to use images of boats in my work. The canoe being a vessel that is historically and geographically prevalent in the West coast of Canada, however, did not work for this area. I felt it had to be a small hand propelled vessel in order that the metaphor of human carried through. I am interested in displacement from nature as well as our interaction with it; of the search for ‘home’ and where it leads us and of both the fragility and resilience of the natural world. The boat, which is made on the land, from the land yet meant for the sea, and often tethered, seemed a compelling and expansive symbol to work with. And the rowboat speaking more to the individual than a group and it represents both strength and fragility. One of the aspects that I found intriguing about ‘the tea bag boat’, is that everyone I mentioned it to was interested in the project. It very quickly became a community project, with people volunteering to help save tea bags and others attending workshops in which they helped to empty the dried tea bags of the tea whilst I recorded them talking about their boat journeys, the idea of home and what tea meant to them. To my surprise, not one person acted dumbfounded at my idea. The enthusiasm I have experienced and the stories that people have shared over the last ten months has formed a cornerstone to my experience here in Cornwall. Being raised by an English mother and Irish father, tea was always important to the social fibre of our household. Anyone entering our home was offered a cup of tea. Every morning, tea. Every evening after dinner, tea. Before bed, tea. An injury, emotional upset, or triumph, tea! And so, for myself, moving to the country that my mother was raised in, tea was my one piece of home, a logical starting point from which to settle in. This boat was made of the course of ten months with 1075 tea bags sewn with over 630 metres of thread. And hundreds of hours. I think people are interested for two basic reasons: one, that the boat is something everyone recognizes but being made of highly unconventional materials adds a sort of delight or whimsy to the concept and presents it as a story, open ended for translating. Secondly, the material itself, the tea bags, are surprisingly beautiful. Each person who has seen them sewn together, even in small batches, is amazed at the colours, textures and associations with other natural elements like leather or wood. There are many aspects this project can work within and the metaphors and stories are endless. While the collecting and sewing took months, I was surprised at how quickly the structure and finally sewing the tea bag fabric to the armature came together. And so it sits, in the Lamorva attic, rocking gently with the wind from the open windows that look out to the sea.